With the big holiday season approaching, I thought it would be fun to take a look at some selections inspired by major holidays that can be worn all year. 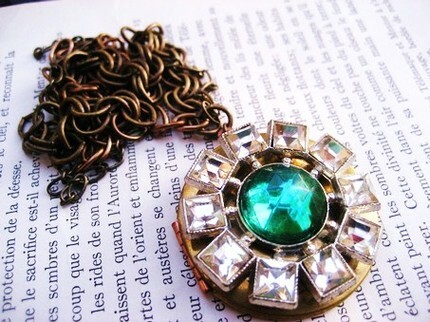 There is nothing like a great piece of jewelry to add a little flair to your outfit. Jewelry can be very personal or just for fun. Like a necklace I have had since I was small with a tiny ruby hanging on a tarnished gold chain or a big chunky colorful bracelet that makes me smile. Since baby Ava loves to tug on my necklaces and earrings [ouch!] I have been wearing more bold rings and bracelets … but still find it hard to resist a killer necklace. 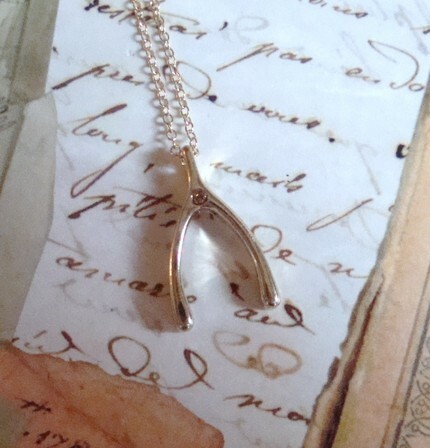 Since Thanksgiving is right around the corner, I’ll start with this Wishbone Necklace by Lanyapi Designs. Make a wish and this gold charm could be yours for only $23.00. I debated whether this Candy Corn Lariat should be part of the Halloween inspired jewelry, but the autumnal colors made me lean more towards Thanksgiving. 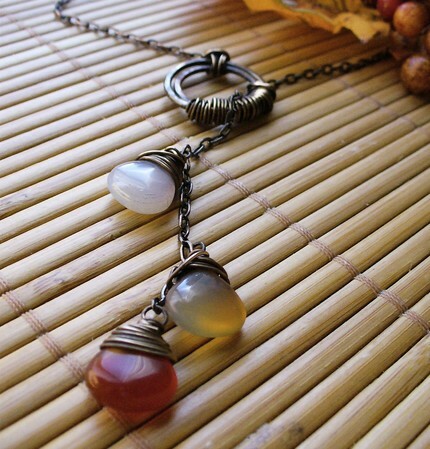 Hanging on an antiqued copper chain, these agate stones are lovingly strung through a hand hammered brass and copper ring by Sally Stearns of SASessories. $39.50. I cannot believe Christmas is next month. There are some people in our neighborhood that already have their decorations and lights up – ridiculous! If you can’t wait for that yuletide cheer, adorn yourself with this awesome “made from vintage” piece by That Jewelry Girl. A rhinestone button attached to a brass locket and strung with a medley of brass chains make for an eye-catching piece. “Hanging of the Greens” can be purchased for $32.50 [free shipping for November!!]. I looked at hundreds of snowflake jewelry trying to find something that didn’t look so ‘tacky Christmas’ and it was no easy task. Finally, I found this charming little necklace by CrArt. I love the copper patina snowflake pendant falling down the side towards the bluest of blue teardrop briolette. It looks so delicate … just like a snowflake. $29.00. Next on our journey through the holidays is Valentine’s Day. A day easily associated with jewelry. 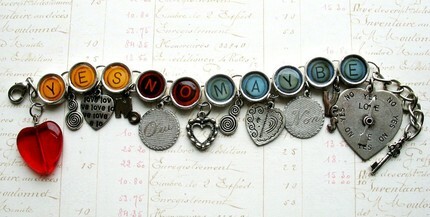 I am hoping that this “Yes No Maybe Love Me Love Me Not” charm bracelet by A Likely Story will BE MINE soon! Charm bracelets are so fun … I would wear it all the time [hint hint, Michael]. $39.95. 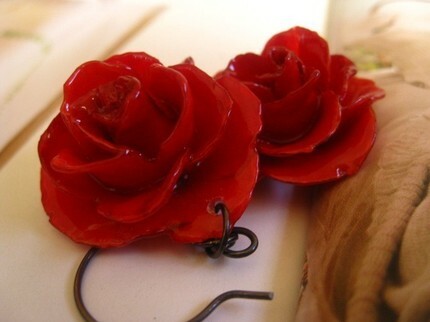 I had to include these beautiful earrings by Royal Princess Designs – they are made from REAL ROSES preserved in thin layers of resin. How cool is that?! $42.00. 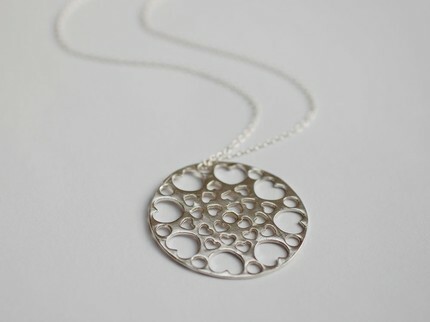 All Those Threes is to thank for this gorgeous Love Mandala necklace. Handcrafted from 99.9% pure silver and hanging on a fine sterling 17″ chain. $58.00. There are so many icons associated with Easter – crosses, colorful eggs, lilies, and of course bunnies. 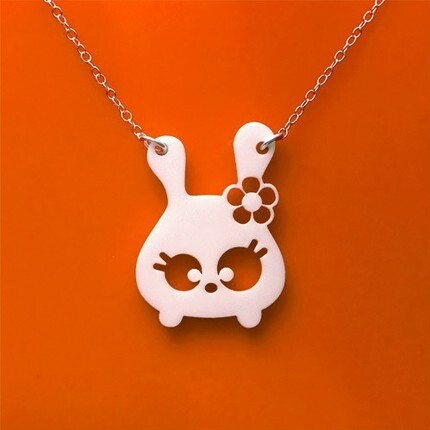 This adorable little bunny charm created by Mariska goes by the name of “Tumsy”. $28.00. 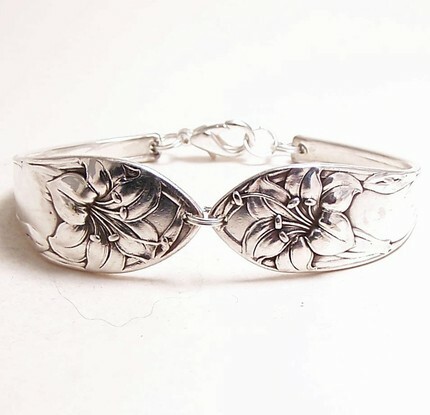 This wonderful Easter Lily Bracelet was made from antique spoons [circa 1907]!! Village Boutique, in my home state of Ohio, turns vintage silverware into amazing pieces of jewelry! $44.99. The Fourth of July doesn’t have to be all Red, White, and Blue. 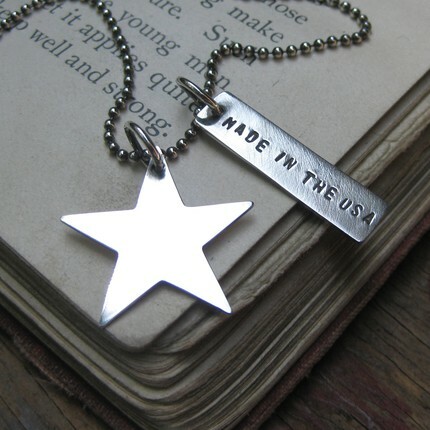 Rebecca Dubay of Vernon Bea Studio created this Patriot Necklace – a hand cut star and stamped tag hanging from a 16″ sterling ball chain. Love it! $53.00. Halloween is such a fun holiday. Pretty much anything goes. 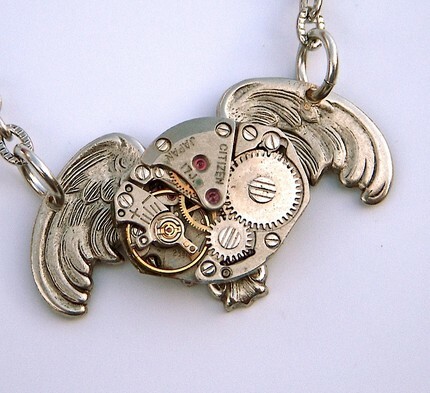 Maybe that’s why I was so taken by this steampunk “Gothic Owl” Necklace by Cosmic Firefly. $45.00. 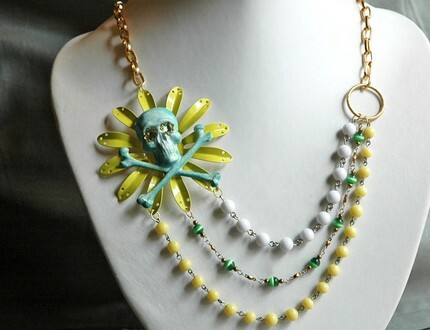 And the final piece of jewelry inspired by a holiday is this “Death by Citrus” piece, which conjures up images of Dia de Los Muertos [Day of the Dead]. 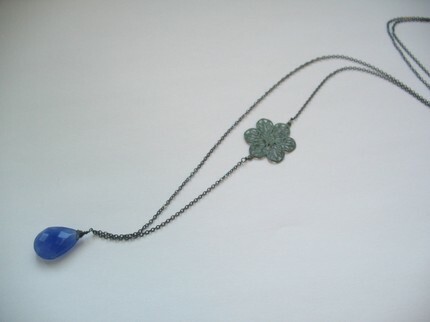 I love the color in this necklace – that vintage enamel flower is awesome! It can be your very own one of a kind Bionic Unicorn creation for $76.00.